Elon University senior Meghan Ann McSharry was arrested early Saturday morning on a charge of driving while impaired. A truck driver crashed into the Psychology and Human Service Studies building Thursday afternoon causing damage to exterior. Building in The Crest Apartments evacuated for "cracked and sagging concrete floor"
All residents of The Crest Apartments building 2020 were evacuated Sunday after Elon University Campus Police found a "cracked and sagging concrete floor," according to Owen Covington, director of the Elon University News Bureau. In a joint email, President Leo Lambert and incoming President Connie Book informed students of changes that are coming to Elon regarding suicide prevention. Elon University senior Olivia Hobbs was struck by a car around 8:30 a.m. Thursday while crossing at the intersection of East Trollinger Avenue and North Williamson Avenue. For reference, this is right near the Elon Post Office and the Town of Elon Police Department. Elon University students gathered in downstairs Moseley to hear the results of the 2017 Student Government Association elections. Candidates crowded around Executive President Morgan Bodenarain as she announced the winners. Elon University senior Haley Muratore was arrested Friday night on a charge of driving while impaired. According to the Elon Police Department, Muratore was driving on East Trollinger Avenue when her vehicle ran off the right side of the roadway striking a utility pole. 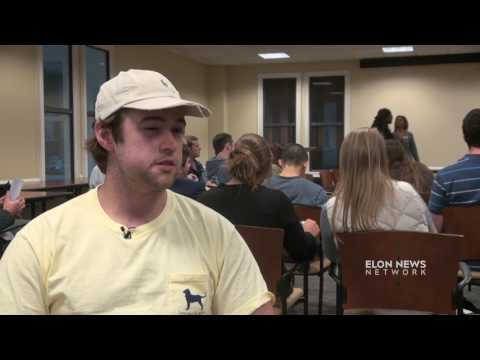 Elon University junior Billy Beresford is scheduled to appear in court on Sept. 28. He was arrested early on the morning of Monday, August 28th on a charge of driving while impaired. Beresford is a member of the Elon University soccer team as a redshirt Sophomore. He appeared in 15 games in 2015 and then redshirted the following year. The New-York based singer, Jon Bellion, was announced as the Student Union Board's (SUB) and SGA's headlining event for this year's Homecoming Concert in Nov.
Elon University freshman Brendan Gallagher was arrested on May 6 for larceny of a hot dog. Gallagher was also charged with resisting arrest and consuming alcohol under the age of 21. According to Elon Town Police, Gallagher was eating the hot dog at Circle K, located at 110 W.
Elon University sophomore Nicholas Conti was arrested on Thursday on the charge of a 'hit and run.' According to Alamance Police, the incident occurred last Saturday at Kangaroo gas station where a Toyota backed into a Ford before fleeing the scene. The Student Government Association hosted its 6th town hall on Thursday, which allowed students to openly discuss the issue of gender and sexual-based violence on campus. The event, moderated by Elon News Network Executive Director Jackie Pascale, was meant to facilitate a discussion about what were issues surrounding the topic of sexual harassment, specifically on Elon's campus, and what the role of students is in solving those issues. The town hall was the first event hosted by the incoming student body administration, which was sworn in just a few days after spring break. Student Body President Morgan Bodenarain said that although there is already a conversation about gender and sexual-based violence on campus, the climate surrounding it is a conversation that the organization wanted to have. "I think a lot of time we talk about how the administration is responding to these kinds of things, but never how the student body is responding to it," said Bodenarain. Officers from the Burlington Police Department and the N.C. SWAT team have evacuated Holly Hill Mall after a report of an armed person.